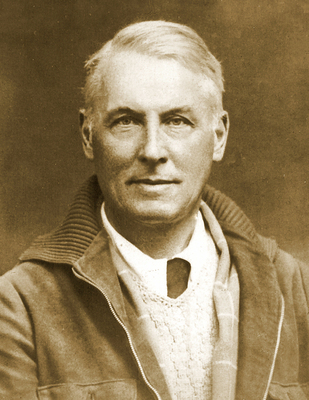 Robert William Service attended the University of Glasgow in 1893 to study English Literature. Service was born in Preston, Lancashire, of Scottish parents, although returned to Kilwinning at an early age. Educated in Glasgow, at the Church Street primary school and Hillhead High School, Service attended the University of Glasgow in 1892. He was taught by Andrew Cecil Bradley, Regius Professor of English Language and Literature (1889-1900) and described as "arguably the greatest literary critic of his day." For the class final project, Service wrote an essay on the play Hamlet by Shakespeare, focusing on the character of Ophelia, which was not received well by Bradley. After a brief period as a bank clerk in Glasgow, Service emigrated to Canada in 1894, and worked at the Canadian Bank of Commerce for eight years in Whitehorse, Yukon, where he published his first book of poems that was to make him famous, Songs of a Sourdough. During the war years, he was a correspondent for the Toronto Star covering the Balkan Wars(1912-13), and an ambulance driver and correspondent in France. He settled in France after WWI and married Germaine Bougeoin. They returned to Canada during WWII, where Service continued to write autobiographical works and novels. After World War II he returned to France with his family until his death in 1958. The Robert W Service Prize was founded in 1961 by his widow in memory of her husband. It is awarded annually on the recommendation of the Professor of English Language and Literature for distinction in the work of the Ordinary class of English.